Oil prices have risen to the point where, when they filter through to gas prices at the pump, are likely to be noticed by consumers. Manufacturing jobs up +24,000 for an average of 12,000/month in the past year vs. the last seven years of Obama's presidency in which an average of 10,300 manufacturing jobs were added each month. February was revised downward by -2,000. March was revised upward by +32,000, for a net change of +30,000. the average manufacturing workweek rose +0.2 hours from 40.9 hours to 41.1 hours. This is one of the 10 components of the LEI. construction jobs increased by +17,000. YoY construction jobs are up +257,000. temporary jobs increased by +10,300. the number of people unemployed for 5 weeks or less decreased by -172,000 from 2,287,000 to 2,115,000. The post-recession low was set over two years ago at 2,095,000. Overtime rose +0.1 hours from 3.6 hours to 3.7 hours. Professional and business employment (generally higher-paying jobs) rose by +54,000 and is up +518,000 YoY. the index of aggregate hours worked in the economy rose by 0.5%. the index of aggregate payrolls rose by 1.1%. the alternate jobs number contained in the more volatile household survey increased by +3,000 (!) jobs. This represents an increase of 2,020,000 jobs YoY vs. 2,280,000 in the establishment survey. Government jobs fell by -4,000.
the overall employment to population ratio for all ages 16 and up declined -0.1% to 60.3 m/m and is up +0.1% YoY. All of the good news I expected in last month's employment report (but was probably negated by the weather) showed up in this month's report. In particular, both the unemployment and underemployment rates declined to new expansion lows. Aggregate hours and payrolls also improved strongly, and hourly wages for nonsupervisory workers tied their expansion high at +2.6% YoY. Involuntary part time employment also fell further, while employment in all significant services and industries rose. About the only flies in the ointment were the pathetically weak +3,000 improvement in the very volatile household number, the declines in both the employment-population ratio and the labor force participation rate, and the slight decline in YoY payroll growth (consistent with my expectation that this will restart its late cycle slow fade). But, all in all, an excellent report. Half a year ago I wrote a long post discussing "the real cost of shelter," by which I meant not just the downpayment on a house, but the monthly carrying cost for a mortgage, and comparing both of those with median rent. That comparison showed that, while the "real" cost of a house downpayment was at a new high, the "real" cost of median asking rent was even higher. By contrast, the monthly carrying cost of a mortgage was quite moderate. This meant that, if a buyer could find a way to put together a downpayment, home-owning was a bargain compared to renting. As I'll show below, six months of price and interest rate increases later, there is even more stress on both homebuyers and renters. 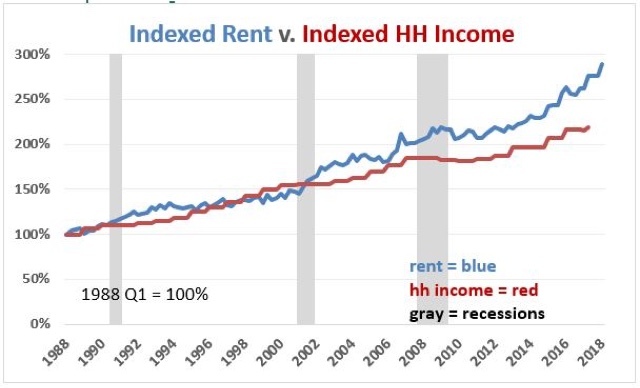 By way of a quick recap, I wrote six months ago that I had never seen a discussion of the relationship between the relative cost of homeownership vs. renting, particularly as a function of the household budget. The choice (or ability) to live in the residence one desires isn't a matter of its cost by itself, but also the relative cost of the type of residence. What is the cost of a house compared with the cost of an apartment? How expensive are each of them compared with a household's income? If both are too expensive, maybe the choice is made to live with mom and dad as an extended family. 1. the "real cost" of a downpayment on a house. In order to generate the "real cost" of buying a house, the best way is to compare the median household income with the median house price. The good news is that Sentier Research published monthly estimates based on the Household Survey into 2017. The bad news is that they discontinued this service a year ago. If that pace continues, by this summer the median price will be about $280,000, 22% above the bubble peak. 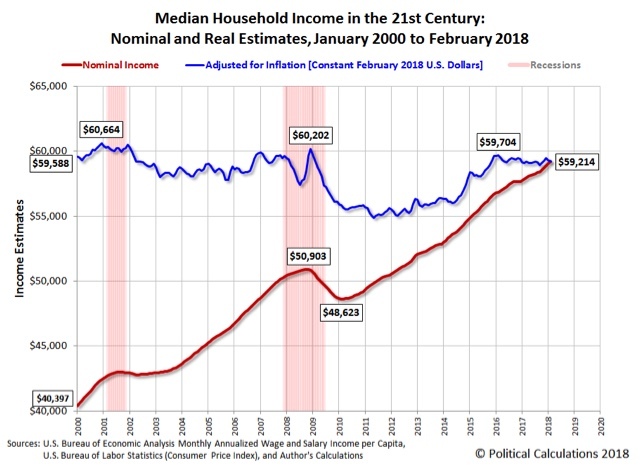 Since nominal median household income has increased about 25% over that same period of time, they will be only aabout $7500, or about 3% below their "real" bubble peak. 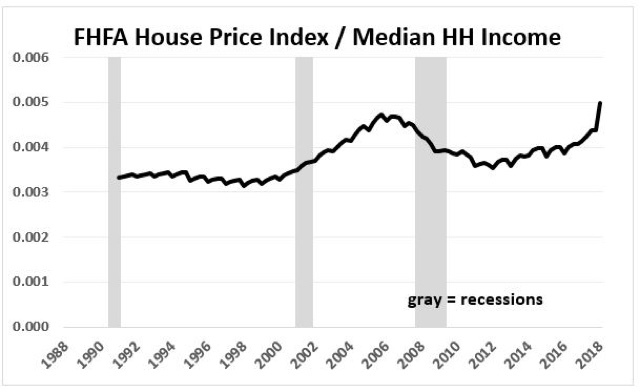 In short, no matter how you measure, in real terms house prices are at or near their most expensive ever, even including the peak of the housing bubble. So, why haven't home sales rolled over? Part of the reason is the demographic tailwind I discussed last week. Because Millennials of peak first-home-buying age now number about 15% more than the Gen Xers of 2005, a build-up that has grown year after year for the last decade, it presumably takes even more financial stress to overcome that tailwind. But there are two other reasons why home sales haven't turned negative yet: the relative (un)attactiveness of renting, and the monthly carrying cost of mortgage payments. Let's look at each of them in turn. In 1988 the median rent averged $343 per month. In the first quarter of this year it was $954. If house prices have risen to new highs several times since the turn of the Millennium, so have apartment rents -- almost relentlessly. In percentage terms, in 1988, the median rent for an apartment was 14.5% of median household income. That rose to slightly over 16% in the mid 1990s before falling to the series' low of 13.7% in 2000. It had risen to a record 18.4% of median household income in the 2nd quarter of 2017, the last available data when I first published this piece. Since then, the situation has only gotten worse. In Q3 median asking rent was 18.7% of median household income. In Q4 it was 18.6%. And in the first quarter of 2018 it rose to 19.3%! So one very big difference between the present situation and that at the peak of the housing bubble is that renting was a *much* more attractive option 12 years ago than it is at present. Recently they have risen significantly. 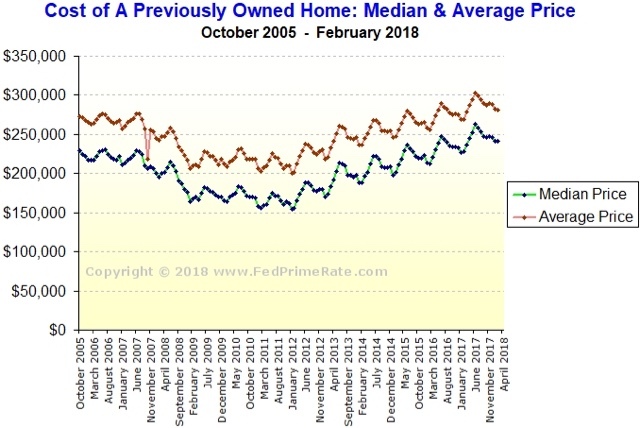 Last year, when I first posted this metric, the monthly payment for the median house wasn't extreme at all, but rather very moderate in terms of the long term range. Going back to 1988, the median mortgage payment was slightly over 40% of median monthly household income. This fell back under 28% at the end of 1998 before rising to 32% in 2000. 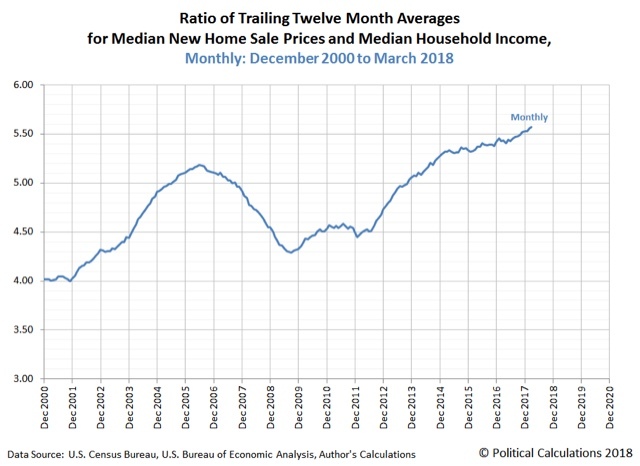 After falling briefly, at the peak of the housing bubble in 2005 it had risen to 31.4%, and actually reached a secondary peak in Q2 of 2006 of just over 35% of median monthly income. At the bottom of the bust at the end of 2011 it made a new low of 23%. As of Q2 of last year, the median monthly mortgage payment was still less than 24% of median household income. Mortgage payments for new buyers in 2018 and not nearly so moderate as they had been earlier in this expansion. But they are not yet at the extremes they were in 2005 and 2006. The overall trend in the last 30 years has been that monthly mortgage payments have fallen from over 3 times median rent to about 1.5 time median rent now. Put another way, even at the peak of the housing bubble, the monthly carrying cost of a house was about 2.3 times the median cost of renting an apartment. At the bottom of the bust, that fell to 1.4 times the cost to rent. For the last five years, monthly mortgage payments have hovered near 1.5 times the median asking rent. 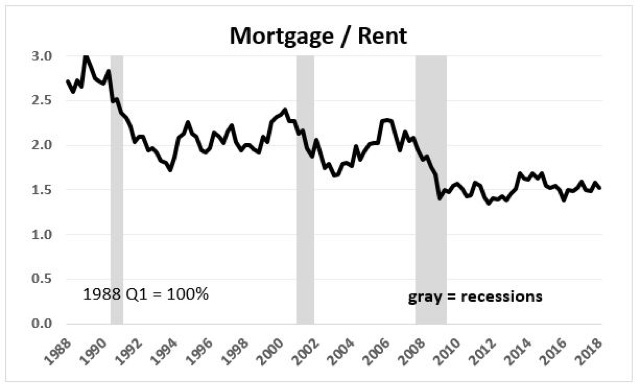 What is particularly noteworthy is that *even with* the recent big increase in mortgage payments, rents have also increased so much so that the 1.5 ratio still holds. By comparing the "real" cost of housing to renting, both in terms of down payments and monthly mortgage payments, we can make sense of some of the biggest trends in the market for shelter. Record down payments are keeping an increasing number of prospective buyers, especially first time buyers, shut out of the market for buying a house. An enormous number are living in apartments instead. This explains both the multi-decade lows in the homeownership rate as well as the recent 30 year lows in the apartment vacancy rates, as a disproportionate number of adults are forced out of home ownership and into apartment dwelling. 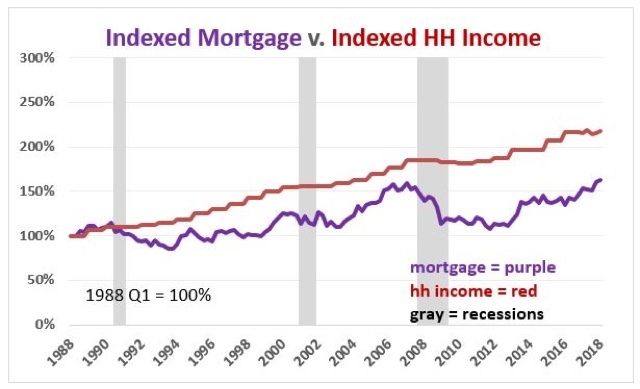 But even with the recent increase in mortgage payments, in relative terms they are still lower than they were at the peak of the housing bubble, and a relative bargain compared with their historical multiple of rental payments. In short, if one can get past the down payment, home ownership still looks like the better choice. Along with the demographic tailwind, the *relative* inexpensiveness of monthly mortgage payments vs. rental payments goes a long way towards explaining why single family home construction has continued to increase in the face of higher mortgage rates. That being said, with increasing financial stress showing up across the board in the costs of both buying and renting, we can only expect to see even more involuntary extended family households and involuntary unrelated housemates. Further, *if* interest rates and housing costs increase much further -- most importantly, if home builders continue to focus on only the most expensive segment of the market -- at some point they will overwhelm the increased numbers of home-buying age Millennials who have been buoying up the market. Sales will turn down, followed by home values, leading to another deflationary bust. 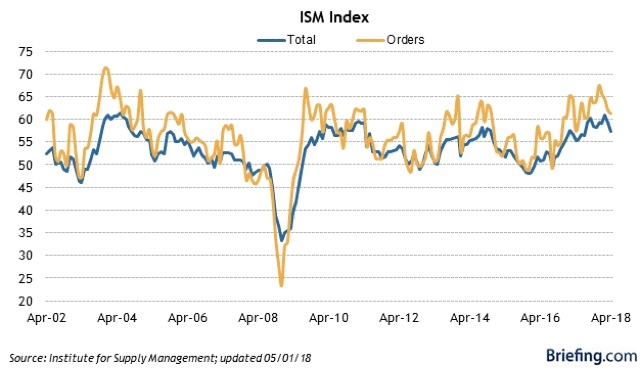 Yesterday and today we got a bunch of leading economic data for both March and April. Last month the short term news was good, while the longer term construction spending data portended a slowdown (but not a downturn). Let's take an updated look. There is also the weekly mortgage applications report, which has just made new highs for the expansion, and which recently has tracked new home sales better than the other series, but has had compositional issues in the past. As of March, both single family permits and private residential construction spending have increased by about 5% YoY. While we had slowdowns even more than this in 1994, 1996, and 2010 without recessions following, actual downturns in 1999 and 2006-07 did presage the recessions. At the same time, in the last two months it has declined from the torrid levels of last autumn and winter. Because GM is no longer reporting on a monthly basis, this metric must be taken with large grains of salt. 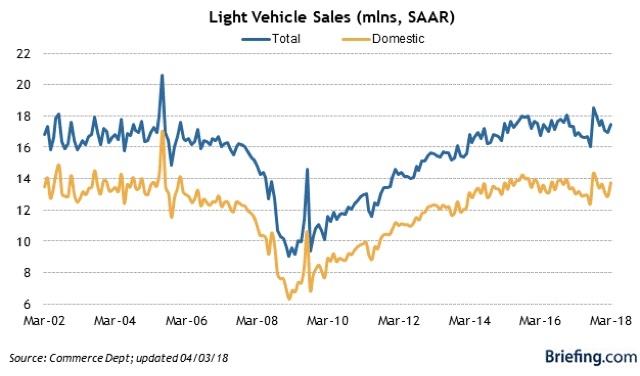 The best way to get around the issue would be to measure vehicle sales ex-GM, and compare with sales ex-GM last month and one year ago. Instead, the services appear to be estimating GM's sales at anywhere between flat and -8% (!!!). This is a recipe for missing a change of trend. Sales tend to plateau for long periods of time during expansions. At this point it is quite clear that there has been a slight decline in trend since late 2016, akin to the slight declilne we say in 2006. The bottom line is that, while manufacturing production should remain strong over the next few months, as with so much other data the slowdown in residential construction growth and vehicle sales are markers of a late cycle slowdown in growth, without any imminent danger of an outright downturn. An era of generally rising bond yields is more likely than not starting, changing the way that the stock and bond markets relate to one another, a point I made after the spike in bond yields in January caused a correction in the stock market. Have the last few months strengthened or weakened that case? I update my observations over at XE.com. Programming note: I've been working on a mega-post about housing, that is now complete except for a few graphs. So, please excuse the brevity otherwise. March 2018 real personal income and spending were both positive. So far, so good. Again, this is consistent with a late cycle dynamic where consumers are more stretched than they were earlier in the expansion. This is also a typical late cycle dynamic (a relationship that holds for 10 of the last 11 expansions). But since neither shows signs of significant declines, there is no imminent danger of a downturn. As has been the case for the last several years.